Is there a way to easily change the list for a newly added item? When making out a specific grocery list (Mom’s Groceries) I need to add an item that I want to have available to other lists in the future. When I scan the bar code or manually enter the information, it automatically assigns the current list name. When I try to change it, the app only lets me move or copy to another list, not “all lists” which would make it available for picking from any list (like my personal grocery list). It is so complicated to get out of the current list to add an item to the master list then have to go back into the current list and pick it. I want to be able to add it while making out my current list, but also have it available for future selection when making out my own list. Can you add “all lists” as a choice for Move to ? 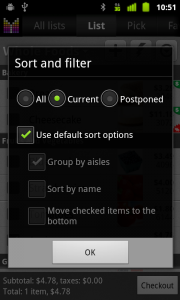 Also, when adding a new item, can you put the option to choose the Aisle upon creation? 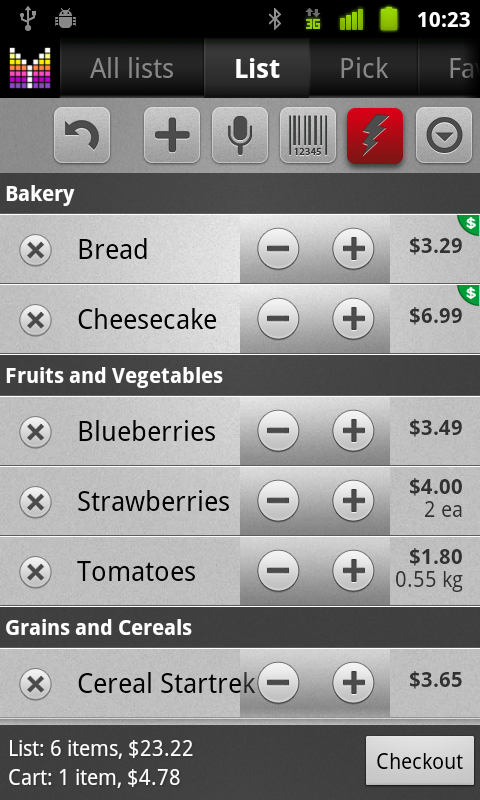 It puts everything I add under “Other” and I have to manually go in change each item to the appropriate aisle. Hi Nancy, thank you for your question. Kindly note that when you add an item and then check it out, it will be placed in History and will be available for picking into other lists in the future. The other option is adding item under Menu > Settings > Pick list > My picks. In other words the app places an item in “All lists” automatically for you. As for changing aisle, you might be interested in using “Details mode” option available under Menu > Settings > Options. I never use the checkout feature and sometimes I hit the Checkout icon by mistake resulting in all my checked items going to history. Then I have to bring them back to my active list! Is there any way to disable the Checkout feature or stop the Checkout icon from appearing on the screen? Unfortunately, there is no way to hide the Checkout button, but you can enable “Long-tap checkout” under Menu –> Settings –> Options which prevents accidental taps on Checkout. Also, please remember that Menu –> Undo comes handy when you need to revert unwanted changes. Love the app! Just one question. Say you changed your mind about an item on your list. Can you remove the item from the list without deleting it or adding it to the cart? I know you can by going into the pick list, but thought there may be a way from the list itself. Thanks! 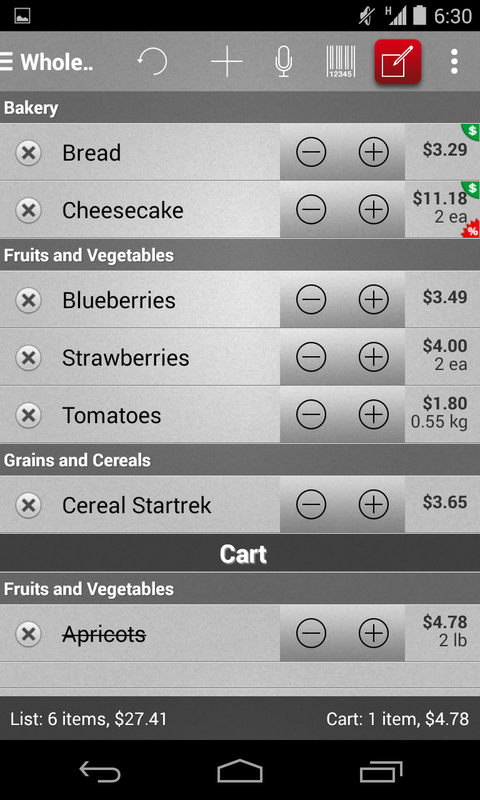 Diana, you can delete item from a shopping list by long-tapping it and choosing Delete. Hopefully this helps. I have my list set to sort by aisles, however it keeps listing everything alphabetically and it’s driving me crazy!! how can I fix this?? Is there anyway I can get voice recognition to work when adding an item without a data connection? Chris, unfortunately, no. Google’s voice recognition needs Internet connection to work properly. 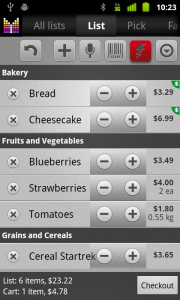 Is there a way to delete items preloaded in the shopping list? Such things that I would never buy like a baseball cap, e.g. Hi Kay, thank you for your question. If you’d like to remove items shipped with the app, just go to Menu –> Settings –> Pick list –> Predefined catalog –> Actions –> Delete presets. Please let me know if you need any further assistance. It works fine with other applications. Hi David, thank you for your feedback. Unfortunately, voice recognition is a feature of Android platform and is supported by Google. Hopefully things will return to normal eventually. Please let me know if you have any further questions or comments. was wondering if there was a way for for to add more sub groups. example under meat can i make chicken,beef,pork. Hi Kelly, thanks for your question. Unfortunately no, aisles cannot have sub-aisles. However you may want to use multiple words in aisle names such as “Meet. Chicken” & “Meet. Beef”. Hi Katie, sure you can modify existing stores or add new ones. 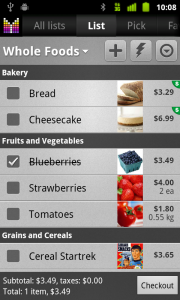 Just go to the All lists tab and follow instructions in the Manage shopping lists User’s Guide. I want to purchase the upgraded version because I love this app, but one thing is holding me back. Is there a way to add 2 discounts/ coupons to one item? For example, if I’m using both a manufacturer coupon and a store coupon on an item? Or, if it’s a BOGO discount but I’m also using coupons? I’ve found ways to force the correct balance but it keeps things from being nice and clear like it is on simple coupon items. I’m hoping there’s a way & I’m just missing it because it would make this the PERFECT app for me!!! Hi Rebecca, thanks a lot for your feedback. Unfortunately, multiple discounts are not supported at the moment. We plan to add this feature in the future, but it may take a while before it becomes available. Thank you!